TRIZ is a brilliant toolkit for nurturing engineering creativity and innovation. This accessible, colourful and practical guide has been developed from problem-solving workshops run by Oxford Creativity, one of the world's top TRIZ training organizations started by Gadd in 1998. Gadd has successfully introduced TRIZ to many major organisations such as Airbus, Sellafield Sites, Saint-Gobain, DCA, Doosan Babcock, Kraft, Qinetiq, Trelleborg, Rolls Royce and BAE Systems, working on diverse major projects including next generation submarines, chocolate packaging, nuclear clean-up, sustainability and cost reduction. Engineering companies are increasingly recognising and acting upon the need to encourage successful, practical and systematic innovation at every stage of the engineering process including product development and design. TRIZ enables greater clarity of thought and taps into the creativity innate in all of us, transforming random, ineffective brainstorming into targeted, audited, creative sessions focussed on the problem at hand and unlocking the engineers' knowledge and genius to identify all the relevant solutions. For good design engineers and technical directors across all industries, as well as students of engineering, entrepreneurship and innovation, TRIZ for Engineers will help unlock and realise the potential of TRIZ. The individual tools are straightforward, the problem-solving process is systematic and repeatable, and the results will speak for themselves. Turns good engineers into great engineers. Karen Gadd has been teaching TRIZ and problem solving with engineering teams from major companies for over 13 years. Her mission is to make TRIZ learning straightforward and the TRIZ Tools easy to use. She has worked on nothing but TRIZ since discovering and learning its power to give us all the routes, to all the solutions, to all engineering problems. In 1998 Karen started Oxford Creativity to concentrate on developing simple and practical TRIZ problem solving for the European market. Karen has taken TRIZ to major companies including Rolls-Royce, British Nuclear Group, Bentley Motors, BAE Systems, Nissan, Pilkington, Borealis and Sanofi Aventis. Oxford Creativity is now well established as one of the world's top TRIZ companies and has helped to make TRIZ well known and widely used throughout Europe and encouraged top companies to create expert TRIZ teams for innovative problem solving. Karen studied Mechanical Engineering at Imperial College, and has an MBA from London Business School. After working in strategy and corporate planning in the City of London she returned to live in Oxford and was a tutor at Oxford's Business School the European School of Management ESCP-EAP (based in Paris, Oxford, Madrid and Berlin). From 1995-2002 she was a Governor of Coventry University. Karen's career has been dedicated to creating new enterprises which make a difference - she founded both MUSIC at OXFORD and the European Union Baroque Orchestra and ran both for over ten years and raised millions in corporate sponsorship to make their activities possible. These successful music organisations still flourish. MUSIC at OXFORD transformed Oxford's music scene and is now approaching its 30th season of top professional classical concerts. EUBO has celebrated 25 years of launching the careers of talented young musicians and has been so successful in its mission, that there are now former EUBO students in every major professional baroque ensemble in the world. Karen launched Oxford Creativity to make TRIZ accessible to everyone and transform and launch careers of TRIZ enthusiasts and champions. There are now thousands of engineers who have learned TRIZ from Karen and who intelligently daily apply TRIZ to solve difficult technical and scientific problems. Karen is long married, has four children and three grandchildren lives happily in Oxford and the Lake District. Karen has recently become a director of the Orchestra of St.John's and concerts and singing are still part of her interests and activities. Foreword (Ric Parker of Rolls-Royce). PART ONE: TRIZ Logic and the tools for innovation and clarity of thought. 1. TRIZ Tools for Creativity and Clever Solutions. 1.2. Who uses TRIZ and why? 1.3. TRIZ and other problem solving toolkits. 1.4. Innovation – Fool's Gold or TRIZ? 1.5. What does TRIZ offer? 1.7. The Golden rule of TRIZ. 1.10. TRIZ Creativity Triggers (to be applied at any/ all stages as required). 1.11. Creativity Prompts - Smart Little People & Size-Time-Cost. 1.12. Size -Time - Cost for visualising solutions. 1.14. TRIZ for everyone – no matter what your creativity. 1.15. History of TRIZ – Science and Engineering Standing on the Shoulders of Giants. 1.16. Reasons to use TRIZ. 2. The TRIZ Knowledge Revolution to access all the world's known solutions. 2.1. Problem Solving – Resolving Defined Problems. 2.2. TRIZ problem solving – accessing known and proven answers. 2.3. Our knowledge is not enough! 2.4. How many answers are there to the world’s problems? 2.5. TRIZ Conceptual Solutions – 4 lists. 2.6. How many types and stages of problem solving? 2.7. From Random to systematic problem solving. 2.8. Problems Vary – some are easy some are difficult. 2.9. How to access our own and the world's knowledge. 2.10. The TRIZ “Dictionary” of the 100 world’s conceptual solutions to any engineering problem. 2.11. Back to first principles. 2.12. TRIZ access to the World's Knowledge. Case Study: TRIZ in Rolls Royce. 3. Fundamentals of TRIZ Problem Solving. 3.1. What is Problem Solving? 3.2. Finding Solutions – Systematic or Eureka Moments? 3.3. I'm a genius – I don't need TRIZ thinking. 3.4. 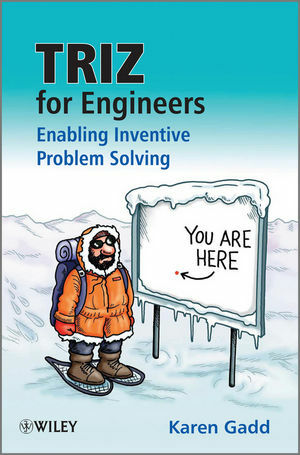 TRIZ – shortcuts for all engineers who take the trouble to learn its processes and tools. 3.6. TRIZ access to fast solutions. 3.7. Locating best answers –obvious only after we have found them. 3.8. Many solutions to any problem. 3.9. TRIZ for sharing solutions. 3.10. Learning TRIZ needs the logic of TRIZ. 3.11. The Logic of TRIZ Problem Solving. 3.12. Understand the problem – where's the fun in that – we like Solutions. 3.15. TRIZ Innovation Audit Trails – the importance of Hindsight in problem solving. 3.16. Audited Systematic and Problem Understanding and Solving. 3.17. TRIZ Basic logic - Improving Ideality. 3.18. Choosing Systems to meet all needs. 3.19. Systems provide functions which provide benefits. 3.20. Using the Bad Solution Park at all stages of Problem Solving. 3.21. Functions or Benefits? Functions imply how we get something but Benefits contain no solutions in their descriptions. 3.22. Avoiding Premature Solutions – Ask Why? 3.23. Asking Why? and How? as practical problem tools. 3.25. Simple Questions to ask in problem solving. 3.26. Stakeholder needs and the Ideal . 3.27. Start by imagining an ideal system. 3.28. Problem Solving at the right price with TRIZ – use trimming and resources. 3.29. Business Benefits of Logical problem solving with TRIZ. 3.30. Conclusion – FLASH SOLUTIONS – the conclusion comes to us in a flash / a stroke of genius. 4. Thinking in Time and Scale. 4.1. Thinking in Time and Scale – Talented thinking for everyone. 4.2. Three strategies to ensure that we all achieve the same level of very creative thinking like clever and creative individuals. 4.3. Time and Scale – helps with all problem types. 4.4. Inventive Engineers – Thinking in time and scale for system context and all requirements. 4.5. Why use Time and Scale? 4.9. Causes and Effects and Hazards Maps. 4.11. Social Harms in Time and Scale. 4.12. Using Time and Scale to Map Hazards. 4.13. Hazards may be caused by a combination of circumstances. 4.14. Preventing hazards in your life. 4.15. Time and scale for hazardous situations. 4.16. Unidentified Manufacturing problem – scrap rate of rises dramatically. 4.17. What neglect or small savings now could cost the earth later? 4.18. Simply by mapping our problem situation in 9 boxes we can check. 4.19. Use 9 boxes to understand history/ context of a problem. 4.20. Time Decisions – not putting the right resources and effort in early in the problem. 4.21. Consequences of short-term fixes? PART TWO: The Contradiction Toolkit. 5. Uncovering and Solving Contradictions. 5.1. Contradictions – Solve or Compromise? 5.2. What is a Contradiction? 5.3. Spotting Contradictions – But & And. 5.5. What is a contradiction? 5.6. 40 principles solve all contradictions. 5.8. The 39 Technical Parameters are. 5.9. Understanding the 39 Technical Parameters. 5.11. The Logical Steps for Problem Solving using the Contradiction Matrix – start with BAD SOLUTIONS. 5.13. Simple TRIZ road map. 5.17. Physical or Technical Contradiction. Case Study: Measurement of Acoustic Emissions in a Flying Aircraft Wing. Appendix - The 40 Principles: theory of inventive problem solving. PART THREE: Fast Thinking with the TRIZ Ideal Outcome. 6. Chapter 6: The Ideal Solves the Problem. 6.1. Simple steps to Fast Resourceful Systematic Problem Solving. 6.2. System We Want – The Acceptable Ideality. 6.3. Ideal – Solves the problem itself. 6.4. Define the Ideal – and then find the resources to create it. 6.5. Ideal – using free resources to attract customers. 6.6. Genius, Resources and Ideal Thinking. 6.7. TRIZ helps us think like great inventors who cleverly use resources. 6.8. Ideal Solution /Machine /User Manual uncover all required functions. 6.9. Systems – Get the Right System and Get the System Right. 6.10. Ideal outcome to help us appropriately ignore/ subjugate constraint. 6.12. Ideal Outcome to Solve Problems. 6.13. Ideal and Constraints, Reality and problem solutions. 6.14. Constrictions = Restrictions on HOW we deliver (Not what we want / don't want). 6.15. The Ideal helps test our real constraints. 6.16. Start with only requirements – initially forget both systems and constraints. 6.17. Ideal, constraints – and the appropriate levels of problem solving. 7. Chapter 7: Resources: the Fuel of Innovation. 7.1. Using Resources – How to become a resourceful engineer. 7.2. Use the resources we've got. 7.5. Locating and Defining Resources. 7.6. Resource Hunts – Focussed by functions which give us "what we want". 7.7. Resources and make or buy decisions. 7.8. Needs – the beginning of any process – Engineering or otherwise. 7.9. Requirements, solutions and resources. 7.10. TRIZ helps engineers balance ingenuity and time to encourage innovation in design. 7.11. Functions = solutions to give us what we want to deliver benefits. 7.12. TRIZ Problem Solving using resources. 7.14. Using super system resources. 7.16. Resources when in peril. 7.17. TRIZ Triggers plus resources for practical solutions. 7.18. Clever solutions use the right and available resources. 7.19. Simple steps to Resourceful Systematic Problem Solving Ideal – Functions – Resources. 7.21. Ideal outcome, Delivered by essential functions – look for relevant resources. 7.22. The Ideal solves the problem itself - Ideal Self Systems. 7.23. Ideal Self Systems - Ideal resources used to design a TOMATO SAUCE BOTTLE. 7.24. Best use of Resources - Overall TRIZ Philosophy. 8. Chapter 8: IDEAL and the Ideality Audit. 8.1. Ideality – Understanding what we really really want and what everyone wants. 8.3. The Ideal in TRIZ comes in a number of names and tools. 8.4. The ideal outcome in the bigger picture. 8.5. Ideality Audit begins with the Ideal outcome. 8.7. Undertaking an Ideality Audit. 8.8. Ideal Outcome prompts us to understand requirements and simultaneously find solutions. 8.10. Ideal Outcome helps us initially say what we want – not always how we'll get it. 8.11. Using the Ideal in Aerospace Problem Solving Sessions. 8.13. Thinking up Solutions is more fun than meeting Needs. 8.14. Different Stakeholders have different Ideal Outcomes. 8.15. Ideality of all stakeholders. 8.16. TRIZ Embraces Solution Mode Thinking. 8.17. Identifying Opposite Primary Benefits. 8.18. Identifying real goals - Owning a Submarine Fleet. 8.20. IDEAL OUTCOME & INVENTING. 8.21. Using the IDEAL outcome for systematic invention. 8.22. Using the IDEAL to invent Systems. 8.23. Using the IDEAL to understand what we want and then achieve it – Improving WINDOWS. 8.24. Problem, Context & initial problem Statement + constraints. 8.26. Ideal Outcome - What do we really, really want? 8.28. Ideal System - What does it do? 8.29. IDEAL Primary Function delivered by Primary System. 8.30. Summary - IDEAL requirements capture & the Ideality Audit. 8.31. Conclusion - IDEAL OUTCOME helps us avoid confused requirement statements containing hidden solutions. Case Study: Using TRIZ to help manage real world requirements. PART FOUR: TRIZ, invention and Next Generation Systems. 9. Chapter 9: System Development and Trends Of Evolution. 9.1. TRIZ Trends for Finding Future Systems. 9.3. The Origin of the TRIZ Trends of Evolution. 9.4. TRIZ Trends and Lines of Evolution. 9.5. Evolution – including Technical. 9.6. Successful Products meet NEEDS. 9.7. Using the Trends for Practical Problem Solving. 9.8. Each of the eight trends divide into LINES of Evolution – different versions with more detail as shown below. 9.10. Ideality is the most fundamental of the 8 TRIZ Trends of Evolution. 9.11. The Power of S-Curves. 9.13. Non-Uniform Development of Parts. 9.14. Simplicity - Complication- Simplicity. 9.19. Transition to the Super-system. 9.20. Trimming out components but keeping all functionality. 9.21. Increasing Dynamism, Flexibility & Controllability. 9.22. Increasing Segmentation & increased use of Fields. 9.23. Matching and Mismatching of Parts. 9.24. Using the TRIZ Trends. 9.25. Ideality is increased by moving from left to right along any or all of the TRIZ trends. 10. Chapter 10: Inventing and TRIZ. 10.2. How to be a great but mundane inventor with TRIZ. 10.4. Product DNA predicts future systems. 10.5. Consider the development of the Breathalyzer. 10.6. The interesting gaps between Inspirational ideas and Scientific proofs. 10.7. TRIZ and all routes to invention – Creating Systems. 10.8. TRIZ helps with the all the major Routes to Invention. 10.9. MEET NEEDS in new ways with new and old systems. 10.10. Find new uses for SYSTEMS / TECHNOLOGIES / FUNCTIONS / FEATURES. 10.11. MEET NEEDS in new ways with new systems. 10.13. FIND SYSTEMS TO MEET NEEDS in new ways with new and old systems. 10.14. Find NEEDS for new or old SYSTEMS / TECHNOLOGIES / FUNCTIONS / FEATURES. 10.15. NEW SYSTEMS - Seek technologies to create / invent new systems to meet very specific needs. 10.16. Ideal outcome & Ideal system & X-Factor. 10.17. Ideal Outcome-What do we really, really want, what is everything we want? 10.18. Find NEEDS for new or old SYSTEMS / TECHNOLOGIES / FUNCTIONS / FEATURES. PART FIVE: TRIZ for System analysis and improvement. 11. Chapter 11: Function Analysis for System Understanding. 11.1. Why use TRIZ Function Analysis? 11.2. Function Analysis and Maps for System understanding. 11.3. Why draw Function Maps? 11.4. Why use TRIZ Function Analysis? 11.5. What is TRIZ Function Analysis? 11.6. Basic Building Blocks for Problem Solving. 11.7. Don't Miss Out or Skip the IDEALITY AUDIT. 11.8. For Problem Solving we need both the IDEALITY AUDIT and the Function Analysis. 11.9. FUNCTION ANALYSIS of the CURRENT SYSTEM (SYSTEM WE'VE GOT). 11.10. Step by Step Problem Solving and Function Analysis - Building a TRIZ Function Map. 11.11. Subject Action Object SAO – Basic Building Bricks of Problem Solving. 11.12. Function Map – All the ‘Subject action Object’s together. 11.13. Function Analysis for understanding and solving simple problems. 11.14. Systems develop to deliver benefits better – Perfecting Functions to deliver those benefits. 11.15. Systems develop in response to changing needs. 11.16. Simple Rules of Function Analysis. 11.17. Finding your SaO is not always easy…. 11.18. Systems are made up of SaO’s. 11.19. Defining the action takes careful thought. 11.20. Function Maps contain all the System and relevant environmental elements. 11.21. System Development through extra Functions. 11.22. The simple systems below have simple Prime Functions which deliver their Prime Benefit and Ultimate Goal. 11.23. Problem Solving from the Function Analysis problem List. 11.24. TRIZ Standard Solutions for solving problems mapped in function analysis. 11.25. TRIMMING – for simplifying systems, reducing costs and removing harms. 11.26. Après Trim – don't stop now! 11.27. Function Analysis at every stage and for every kind of difficult problem. 11.28. Using Function Analysis on real and difficult problems. 11.30. System Analysis & Function Analysis. 11.31. Simple Answers to Simple Questions. 11.32. Glossary of TRIZ Terms for Problem Solving. 11.33. Example of Function Analysis of a single item – a Coffee Cup. 11.35. Function Statements -SUBJECT action OBJECT to solve problems & contradictions. 11.36. Function List of all components & their interactions. 11.37. Draw TRIZ Function Maps. 11.38. Function Analysis for locating and dealing with the causes of problems - Roadside Bombs. 11.40. Appendix 11.1 – OXFORD TRIZ standard solutions re-arranged into three categories. Case study: Pouch opening at Mars. 12. Chapter 12: Classic TRIZ ARIZ and Su-Fields. 12.1. ARIZ & Substance-Fields in Altshuller's Development of TRIZ Tools. 12.2. Substance-Field Analysis or Su-Field Analysis. 12.5. 76 Standard Solutions and accessing them with Substance-Field Models. 12.6. Simple steps for applying Substance-Field Model Analysis to Problems. 12.7. Simple example of Substance-Field Analysis using the Standard Solutions. 12.8. ARIZ – An Algorithm for Inventive Problem Solving. Appendix: Traditional TRIZ 76 standard solutions. PART SIX: How to problem Solve with TRIZ – the Problem Solving Maps. 13. How to problem Solve with TRIZ – Simple Algorithms for the TRIZ Toolkit. 13.1. TRIZ for the right functions at the right time in the right places. 13.2. Where do we start with TRIZ? Which tools when? 13.3. TRIZ is immediately useful but understanding takes some time and practice. 13.4. There are two fundamental areas in practical technical problem solving. 13.6. Four Simple Steps to Define the Ideal, uncover required functions and deliver them from Resources. 13.7. Summary on Resources - Ideality Tactics. 13.8. The Power of TRIZ Problem Solving. Case study: New BAE Systems SRES.